How to Choose the Right Oxygen Mask? are used to transfer medication, including oxygen, and asthma medication to the trachea and lungs of a patient. There are two types of face masks; Oral Nasal Masks which cover the nose and mouth and Full Face Masks which cover the whole face. Both types should only be used when ordered by a doctor or medical care provider, and can be used within the hospital, clinics or at home when necessary. 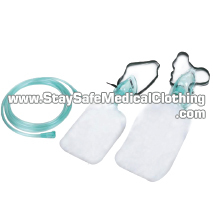 The masks for hospital and clinical usage are usually made of Polyvinyl Chloride (PVC) as this material is cheap and disposable. The plastic material allows the face masks to be transparent which limits the sensation of claustrophobia in some patients, and also allows the medical care provider to assess the patient’s face. 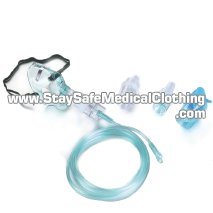 The oxygen or supply of medication is either connected via a tubing or comes in a breathing bag/cup which is attached to the mask itself. The latter allows for deep breathing without wasting oxygen or medication. StaySafe™ Medical Clothing Oxygen Masks are all ISO, CE and FDA approved. They come in various levels of protection, sizes for both children and adults and price points to meet the needs and req uirements of all markets. Oxygen Masks are used within oxygen therapy when a patient needs a higher concentration of oxygen than is present in the environment naturally. They transfer oxygen gas from a storage tank or breathing bag to the lungs, and can be used for several chronic and acute conditions including chronic obstructive pulmonary disease (COPD), cardiac failure, emergency operations, major trauma, hypothermia and convulsions. 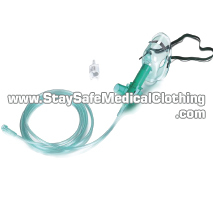 An oxygen mask must always be used with the close monitor of a doctor or medical care provider. Nebulizer Masks are used to administer liquid medication, including relievers, preventers and oxygen (if patient’s oxygen levels are low), in the form of aerosol droplets for easier administration. This is inhaled through the mask or a mouthpiece that is attached to the face mask. The medication can be administered via a tank or a cup which is attached to the mask itself. A normal dose will take about 5-10 minutes to be inhaled fully. They can be used in emergency situations, such as when a patient is having trouble breathing and to manage chronic respiratory conditions such as COPD, cystic fibrosis, and bronchiectasis. On occasion they are also used to manage asthma, however this is advised for limited use only, as there are cheaper and faster ways to take the necessary medication. Use of nebulizers should be under the strict recommendation and observation of a doctor or medical care provider. Venturi Masks, also known as air-entrainment masks, are used during controlled oxygen therapy to deliver a predetermined oxygen concentration to the trachea. 100% oxygen flows through the mask which draws in a controlled amount of air. 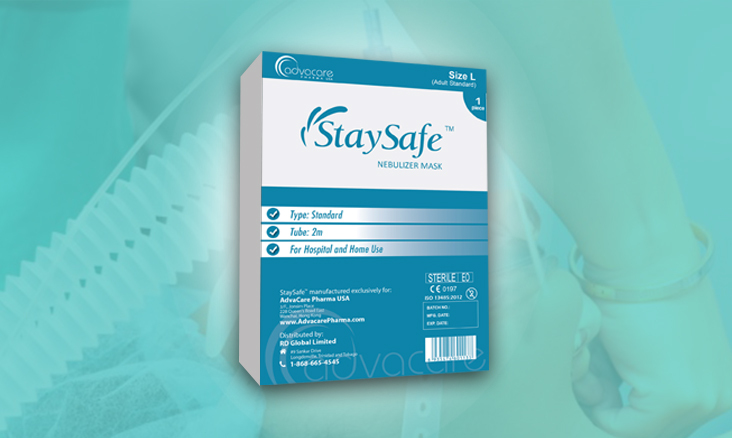 Commonly available masks deliver 24, 28, 31, 35, or 40% oxygen. Why should I use StaySafe™ Oxygen Mask? 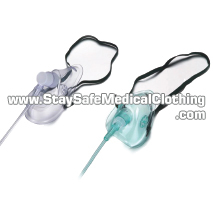 StaySafe™ Medical Clothing Oxygen Masks are all ISO, CE and FDA approved. They also come in various levels of protection, sizes for both children and adults and price points to meet all needs and preferences. CC stands for cubic centimeter. It is a unit of capacity. It equals to 1 mL. Therefore a 6cc nebulizer has the capacity to deliver 6mL of medication. What do the percentages for the diluters refer to? The percentages refer to the concentration of oxygen they can deliver. These are color coded for different concentrations. Are StaySafe™ Oxygen Masks re-usable? In general they are intended for disposal after a single use as this reduces the risk of cross-contamination. This is however dependent on setting in which they are used. In a hospital or clinic setting they should be disposed of after a single use. Under no circumstances should a face mask be re-used for different patients. If they are used for long-term purposes outside of a hospital which is sometimes the case with nebulizers, then they can be re-used by a single patient. However the face mask must be cleaned and maintained according to the instructions. Can Oral Nasal Masks be used at home? This depends on the patient’s condition and if it is absolutely necessary to maintain the condition. This decision should be made by a health care professional such as a doctor or registered nurse. Do you have more questions about our Oxygen Masks? Contact Us!